Student Adam Munich won the Engibous Prize at the Texas Instruments Analog Design Contest. Student Adam Munich has truly been a pain. In his first year at RIT, he got into trouble for cracking our IT security systems just to show us how easy they were to break into. He also took on several self-directed engineering projects in our various labs and shops by mostly breaking our rules and borrowing material and equipment wherever he could find them. One of his projects was an advanced Tesla coil, which he wanted to demonstrate at our Imagine RIT: Innovation and Creativity Festival. But since it operated at a high voltage, we told him he could not turn it on for safety reasons. I guess we showed him! Well, actually, he showed us. 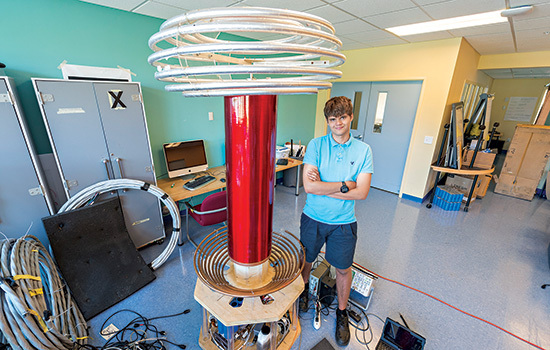 His Tesla coil won the Engibous Prize at the Texas Instruments Analog Design Contest and Summit in Dallas this summer, taking home the grand prize of $10,000. The awards panel at TI was astonished at both the sophistication of his design and the innovation he showed in actually producing a working model. And they were even more astonished to learn that he just finished his freshman year. Adam has quite honestly attributed a fair amount of his success to his quiet circumvention of our various rules and regulations. I think in the wake of this experience we need to be willing to ask ourselves whether we are getting in the way of talented students like Adam or recognizing their potential and finding ways to support them. As a result, I have asked Adam to work with us to help create a kind of student “skunk works” or “hacker space” that would support student-directed projects more effectively. These interesting predicaments and opportunities will increase as our national and global visibility continues to rise. Yet we have more to accomplish to accelerate our momentum. What will it take to get there? We need to continue on our path to extend our geographic reach in our recruitment of the most talented students, faculty and staff. We must continue to grow our reputation as a place where innovation, creativity and entrepreneurship flourish. We must continue our efforts to diversify our student, faculty and staff populations and tap NTID’s presence on our campus. We must continue to get RIT’s name out there across the country and around the world. We must continue to be seen as a place where students and parents get a real return on their investment. And we must continue to develop as a place where the best and brightest come to find their futures. So what is next? The university’s leadership will soon begin a new strategic planning process. RIT’s current plan will end in 2015 and it is vital to our continued success that we smoothly transition to a solid plan for the next decade. I am excited to be part of charting the course for RIT’s next decade and look forward to active participation from the campus community, our alumni and our many donors and friends.